and the Towner Gallery in Eastbourne. On the last occasion I visited the De La W arr pavilion in Bexhill, I witnessed a thrilling installation on the roof involving skateboarding inside a mesh cage. How would our visit compare? 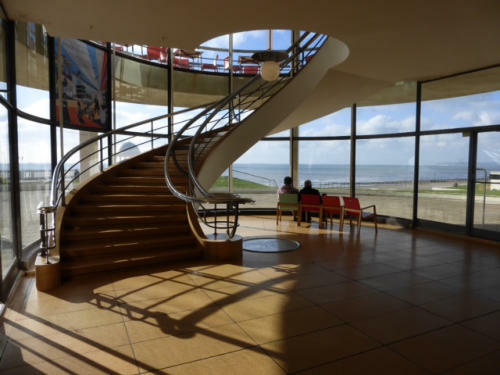 The day started auspiciously with the “modernist” building bathed in warm Autumn sunlight alongside a sparkling English Channel. The building, dating from 1935 is industrially influenced with its use of concrete and steel and is recognised as one of the first major modernist buildings in Britain.  Entering, the iconic “stairway to heaven” encouraged us to climb and explore but beforehand groups were given behind the scene tours that brought home the full and varied uses of the building not only as a venue for arts and crafts but with a busy theatre. Currently two important artists have exhibitions in the galleries. 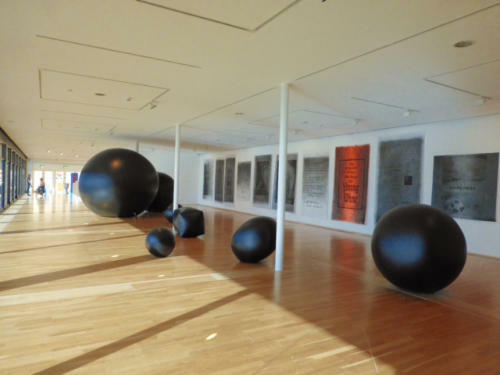 “Buoys Boys” is an installation by British artist Fiona Banner, consisting of jet black, helium filled, inflatables. Displayed in a sun filled gallery they were very eye catching, and were described as “referencing the limitations of language through the use of full stop sculpture”. A loop video showed the inflatables floating from the roof over the channel. 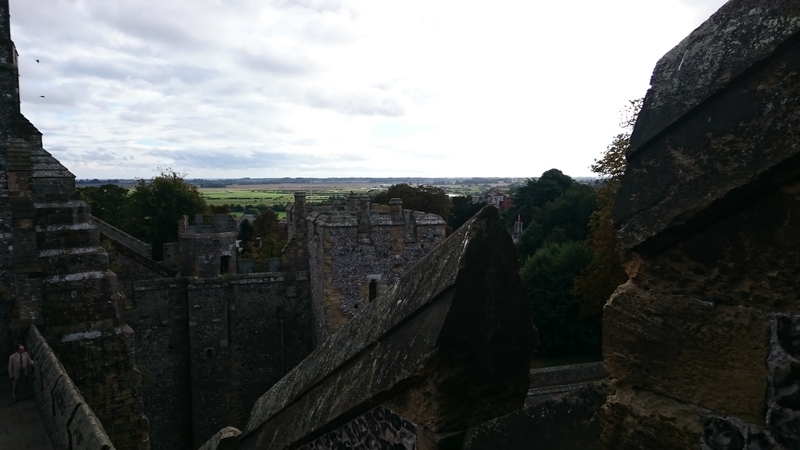 She notes the English Channel as something beautiful but dark, including a very timely mention of the 1066 invasion. Less striking, but eye catching in its neatness and precision was the display of 2D and 3D Alphabet, Numbers and Letters by “the godfather of British pop art” Sir Peter Blake. 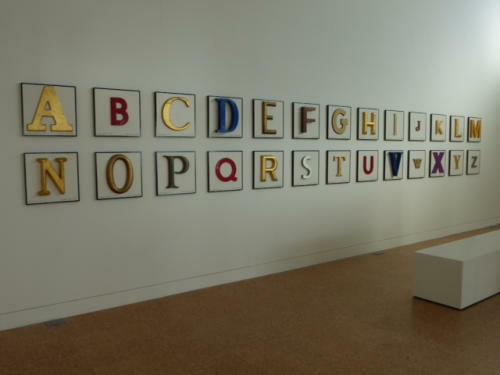 The exhibition relates to his enduring interest in childhood innocence and nostalgia. 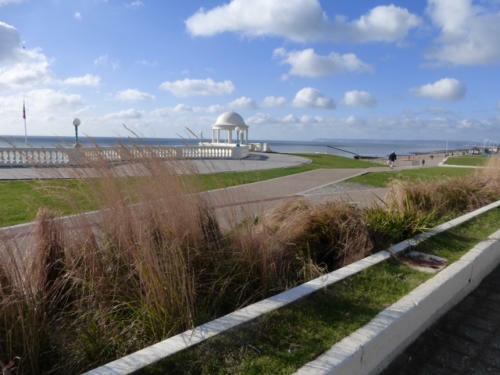 Mention must be made of the beautiful areas outside the building including a concrete band stand that echoes the style of the building and a grassy area where, in summer weather, films are projected onto the building for all to enjoy. 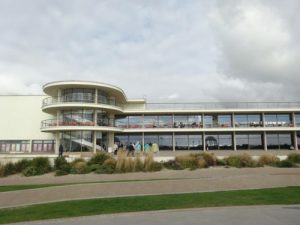 We left with our minds buzzing, looking forward to lunch in Eastbourne and yet another “feast for the eyes and mind”. At our second venue the Towner gallery, the visit to the paint store was for many the highlight of the day. Housing artwork from the 4,000 items either owned or on loan, displayed on huge sliding panels, the store was a treasure trove. We were divided into three groups for our mini lecture in order to maintain a constant temperature and humidity in the room. 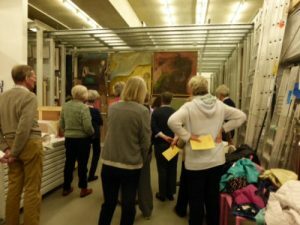 One screen was home to an Eric Ravilious collection on loan from the family that provided hints of a special exhibition planned in 2017, not to be missed. Another outstanding exhibit was a painting by John Virtue, a black and white seascape so large that it actually required a complete screen and filled the width of the store. The gallery is currently featuring a collection “Towards Night” based on aspects of nightfall and includes works by Constable, Munch, Turner and many more, whilst the Ravilious room’s Paintings of People included work by Freud, Hockney, Sickert and others, plus Ravilious memorabilia. 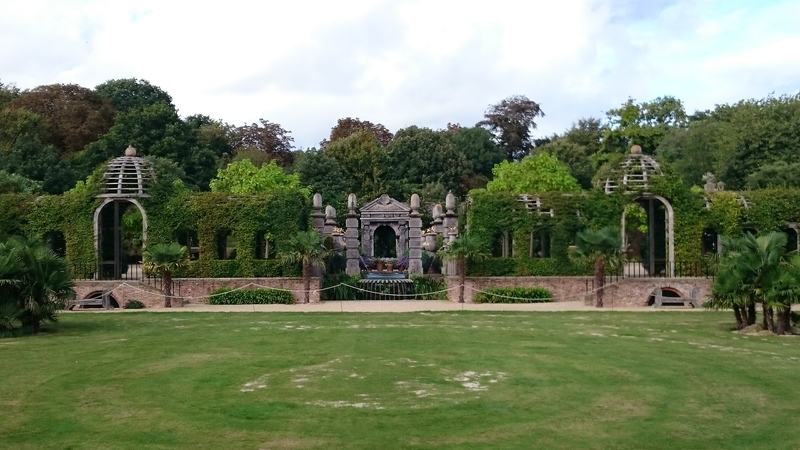 The journey home was noticeably quieter, minds no doubt full of memories of the special artistic heritage that continues in Sussex to this day. 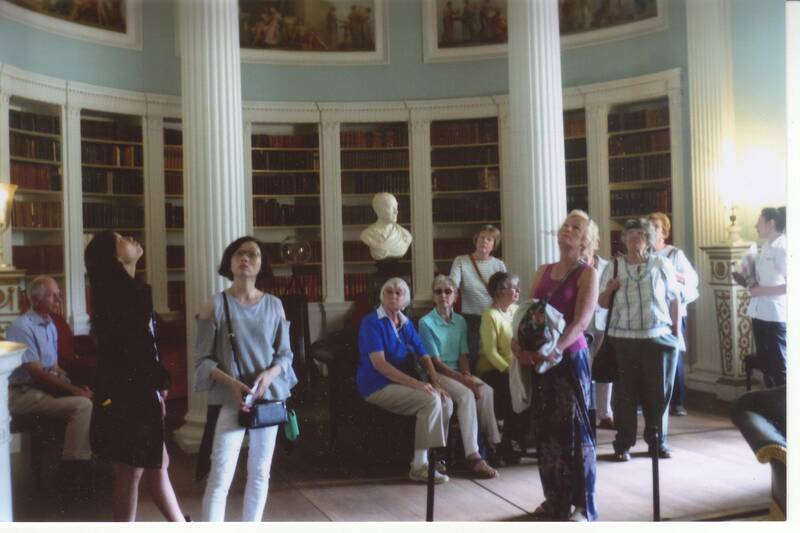 Thanks again to Margaret for managing a two-centre visit with split groupings – no mean feat!Many Thanks to Maura and Sue Richardson for supplying the pictures. The Medici rose from wealthy bankers to autocratic rulers of the Duchy of Tuscany, linked by marriage to the ruling families of Europe. In this Day of Special Interest, we chart this shift in the Medici powerbase in Florence from Republic to autocratic Duchy by studying their patronage of art and architecture which will include Donatello’s David, the frescoes by Benozzo Gozzoli in the beautiful Medici Chapel, the mythological works of Botticelli and the building of the Uffizi. This Session largely concentrates on the patronage of Cosimo de’Medici in the mid-15th century – and the way in which he deflected criticism of self-aggrandisement at a time when Florence was still a Republic, concentrating on the building and decoration of the Palazzo Medici in the 15th century and including Donatello’s David and the Chapel of the Magi frescoes by Benozzo Gozzoli. This Session looks at the patronage of Lorenzo de’Medici (‘Il Magnifico’) by which time the Medici are covert rulers of Florence. This is reflected in his use of art for diplomatic purposes and his preference for collecting priceless antiques: an aristocratic past-time. The centre of an elite circle of humanist scholars, we shall study how their ideas influenced the works of Botticelli. This Session looks at the patronage of Duke Cosimo 1 de’Medici in the early 16th century, by which time the Medici are autocratic rulers of Florence. This is reflected in his transformation of the Palazzo della Signoria from the seat of Republican power to the headquarters of a ruling dynasty and in the building of the Uffizi as a symbol of his bureaucratic control. After a long but varied journey from Rustington, we arrived at the picturesque area of Hampstead Heath in mid-morning. 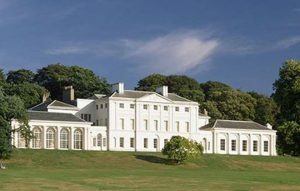 The grounds of Kenwood were ours to explore and there were lakes, sculptures – including contributions from Barbara Hepworth and Henry Moore – and undulating landscapes to enjoy. Amidst the grandeur children were skipping or playing rounders with their school group which gave a sense of vibrancy and a holiday mood. Always however, atop the large mounds overlooking all, was the eighteenth century Robert Adam house. 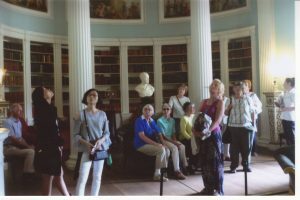 The Arun party of just over 30 members was split into two groups for tours of Kenwood House, which included works of Old Masters, featuring Vermeer, Turner, Reynolds, Gainsborough and Rembrandt in magnificent panelled rooms. Overall the visit to Kenwood was a stimulating mix of a coach journey around the attractive area of Hampstead Heath and North London, delightful walks and good refreshment provision, all highlighted with the visit to a compact yet architectural gem of a period house. 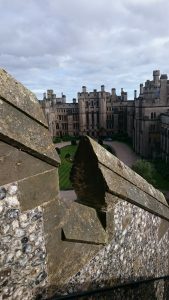 At our Annual General Meeting in July we received an invitation from our Patron, the Duchess of Arundel, for some of our members to visit Arundel Castle for coffee and a tour of the castle and gardens. There were limited numbers of places available and they were all allocated at the AGM with everyone wanting a ticket on the day getting one.